Hershey PA, April 16, 2015. 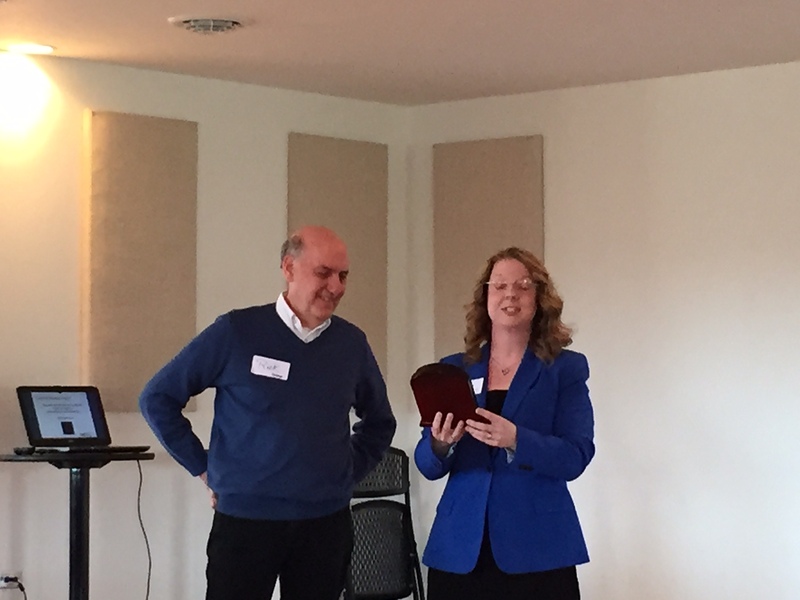 Rick Stamm was honored by the Central PA Chapter of ATD by receiving the Life Time Member Award. Rick has served in various board capacities including President over the years he has been a member of the chapter. He has also hosted and facilitated the monthly Red Rose Learning Community meetings for the Lancaster PA geographic interest group over the past 20 years. Lancaster, PA October 6, 2014. The TEAM Approach inc, a Lancaster PA based team and leadership development firm, has announced the purchase of VitalEDU, a Jackson Mississippi business that sells workforce development solutions to the Community College Market. The workforce skills include supervisory training, customer service, sales training, and communications and relationship skills. The TEAM Approach has provided workforce development solutions directly to businesses since 1986 according to Susan Stamm, president of The TEAM Approach. “We are thrilled for the opportunity to extend our ability to meet workforce development needs across the US through VitalEDU” says Stamm. Community Colleges interested in partnering with VitalEDU, can visit a new website at http://www.vitaledu.com. The TEAM Approach has established affiliate relationships with several publishers of training content to meet workforce development needs. Details on these can be found at http://teamapproach.com. The TEAM Approach offers over 1000 eLearning courses, classroom and blended training modules, assessments, and training for executives, managers, supervisors and teams and will continue to operate under the existing name, with the new VitalEDU division serving the Community College market. NEWPORT NEWS, VA (September 17, 2014) – Performance Support Systems, Inc. (PSS) announces a breakthrough to a costly problem that has plagued companies for decades. According to recent State of the Industry reports released by the Association for Talent Development (formerly ASTD), much of the more than one hundred billion dollars spent annually by U.S. companies on training and development is wasted because what is learned is not applied on the job. The ProStar Coach online coaching platform solves this problem in two ways. First, its interactive technology enables ProStar Coach subscribers to get ongoing input, ideas and feedback about their progress through the program’s unique “Coaching Network” – made up of managers, coworkers and others who care about their development. And now, through a new series of coaching videos, these supporters are able to apply coaching techniques used by experienced, professional coaches. This combination of support coaching and online virtual coaching empowers effective reinforcement and implementation of skills during the months following a class, workshop or seminar. For more information, contact Rick or Susan Stamm, (rick@teamapproach.com or susan@teamapproach.com) or call 717-672-0425. (June 17, 2014) Susan Stamm discusses a new trend of branding employees with tattoos to drive employee engagement with Human Resource Executive magazine. Susan Sta mm discusses the use of Talent Shows by organizations as an employee engagement strategy in this Human Resource Executive Online article. In this article which appeared in PA Business Women magazine, Susan Stamm interviews female CEO’s of organizations that have been designated best places to work in Pennsylvania. The article, called Leadership and the role of Engagement, can be found on page 11. Susan Stamm is interviewed on the Michael Dresser Show where she shares some of her thoughts about employee engagement. Susan Stamm is interviewed on the Be Good Ventures show by Nick McCormick to discuss Rule 6: Be a Low Tech Communicator.